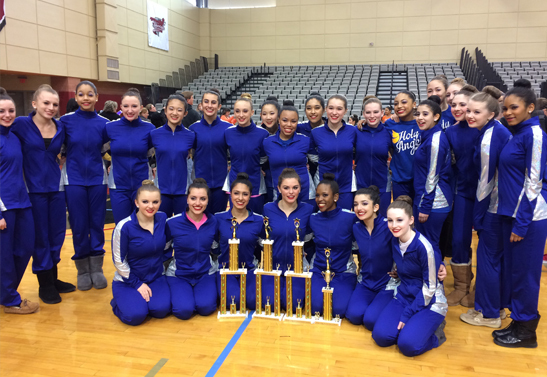 The Academy of the Holy Angels Dance team has celebrated some very impressive victories and accomplishments in recent weeks. At the UDA Battle of the Northeast Championship held on January 4, 2015 in South Brunswick, NJ the Junior Varsity dancers took first place in Hip Hop and third place in Pom, while the Varsity team earned second place in Pom and was named the UDA Northeast Champions of Hip Hop for their dynamic routine. The Varsity Angels also earned a special Crowd Favorite Award for their Hip Hop number. The girls then went on to compete at Ramapo College’s Dance Team Invitational on January 10, 2015 where the Varsity dancers took home first place trophies in both the Pom and Hip Hop categories while the Junior Varsity dancers placed first in Hip Hop and second place in Pom. Three Varsity team members also recently learned of their acceptance into New York University’s prestigious Future Dancers Program which is a 14-week highly selective advanced training regimen designed to support and enhance their current training. Caroline Fernandez (Teaneck), Amanda Hagan (Franklin Lakes), and Amanda Hernandez (Northvale) were among the 15 selected participants from the five boroughs of New York City, as well as from Westchester County, Long Island, New Jersey, Connecticut, and Philadelphia.